Authored by Campbell Barton (campbellbarton) on Aug 13 2014, 1:17 PM. Martin Felke (scorpion81) retitled this revision from to Solidify Modifier "Rim Only" Mode. Martin Felke (scorpion81) updated this object. Martin Felke (scorpion81) added a project: BF Blender. Martin Felke (scorpion81) added subscribers: Martin Felke (scorpion81), Campbell Barton (campbellbarton). Rather not add this option, if its only offsetting then its just a displace modifier, and we have an existing displace modifier for that. Why add the extra loop when MOD_SOLIDIFY_RIM isn't used? Martin Felke (scorpion81) edited edge metadata. Since there is opportunity for errors if MOD_SOLIDIFY_NOSHELL is tested and the rim isnt set. *picky*. naming, already a bit confusing to newVerts, numVerts ... now nVerts... try have something a bit more identifiable? Would rather split this into its own block. Campbell Barton (campbellbarton) edited reviewers, added: Martin Felke (scorpion81); removed: Campbell Barton (campbellbarton). this makes the displacement modifier for my line of work useless. logically it makes more sense to include the surface off-set command into the solidify modifier. This option is filling lacks of displace modifier on borders. Without it , faces of plane surfaces are doubled and it gives wrong results at render. hmm, seems the entire modifier would need a remove doubles step, maybe optional even so double verts or faces would be merged. I could try to add one, but unsure whether it will be accepted, since this double face behavior is present without the new option checked as well. A quick and dirty way would be to use the according bmesh operator for this, but converting the derivedmesh to bmesh and back causes a performance hit and wont be accepted i think. Currently i am not aware of another easy way to solve this directly on derivedmesh level. I would hope so - I do not know what it was assumed to be the same as displace because it is not. what the displacement modifier is intended for. or just only having the surface interactively offset and not showing the original surface like what displace does. I would not call offsetting a surface a deformation. Displaced does deform offset generates if you follow the logic of the end result. However I can see the value in just a surface offset modifier. That might be true, it is still not logical and I cannot enter 25cm or 0.25" or 5/16" into the strength. makes no sense when dealing with the baseline offset. And even thickness option for the displacement modifier would provide the needed off-set functionality but because all my entries are often imperial and metric it would make it a hassle to use the strength. I can see in the sense of Blender that displace might be a fit being an interactive deform tool, while solidify by what it does is more a fit when comparing how other cad programs structure the work. 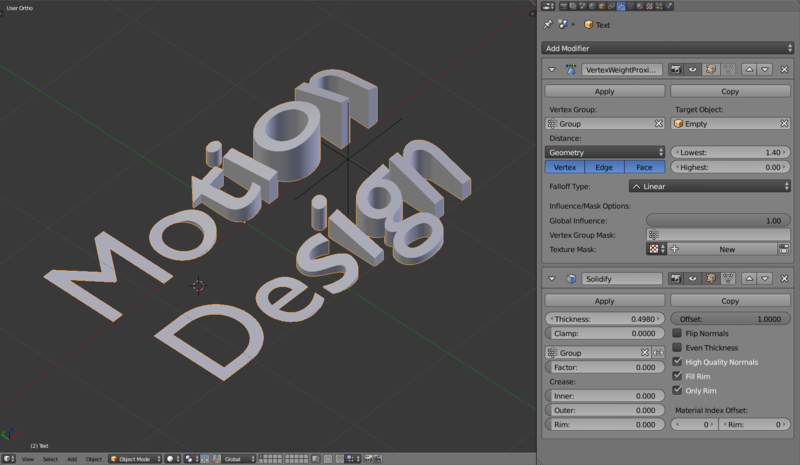 Bend is considered a deform task, offset a geometry generation task. However considering that Blender is not a CAD system I could see this work either way Solidify or displace. But for displace to be useful naming and unites have to change and work which is why I think solidify is just a better fit. If it is just an UI problem perfect!